Often “accommodation” is defined as something that is supplied for convenience or an act that is done to a person, often for convenience or to reconcile differences. Just to be clear, we don’t like these definitions, but all too often this is what non-disabled individuals have thought the term “accommodation” means. For providing accommodations in higher education, such definitions do not ensure confidence in disability services staff. When we shift our lens to focus on accessibility, however, we view accommodations very differently. They are no longer about convenience but about equal access necessary for learning, attending events, and participating in programs on Hope’s campus. MYTH 2: Academic accommodations force faculty to lower academic standards, but in actuality, academic accommodations for courses do not change what but how students learn. For example, a student who is deaf or hard of hearing may capture lecture content by using an assistive listening device, real-time captioning, or an ASL interpreter. Students who are blind or visually impaired may use text converted to Braille, a screen reader, or a magnifier/reader. Students approved for note-taking assistance (for a variety of disability-related reasons) may use technology to take pictures of the whiteboard, to type notes, or record lectures. MYTH 3: Academic accommodations create unfair advantages for students, but again, directly from the article: “In my experience, modifications to examinations, particularly extra time to complete them, rank first in triggering faculty concerns about treating all students fairly. The objective of providing individuals extra time on examinations is to measure what students have learned rather than the impact of their disability. When a student’s performance speed is a skill a professor intends to measure, extra time on an examination would not be an appropriate accommodation.” Still not convinced? Try out this demonstration on the Stroop Effect. We are updating the Disability Services website and have added information for faculty regarding rights and responsibilities when providing students with accommodations. You can read the entire list on the website or review a few key points below. More updates are coming soon. Please continue to check the website for answers to your questions, or feel free to contact Disability Services. Trust the expertise of Disability Services staff, and provide students with accommodations as outlined. If you have a concern about an approved accommodation, contact Disability Services to discuss it. To request academic-accommodation verification of a student’s eligibility for any requested accommodations. Disability Services is the only office designated to review disability documentation and determine eligibility for appropriate accommodations. Please refer students to Disability Services if they are seeking accommodations without proper documentation. To administer an accommodation as it is stated by Disability Services. If students believe accommodations are not meeting disability-related needs, refer them back to Disability Services. To expect the same conduct standards for each student in your course. Mid-term exams have started, and you probably have a few for which you are preparing, or should be! Preparation, of course, is the number one key for success, but there are also some good strategies for taking multiple-choice exams. The ASC has gathered some videos we think you might find helpful. There are quite a few on YouTube, but after previewing a bunch for you, these short videos contain the best and most succinct information! Remember, the ASC has many services to help you succeed. Check out everything we have to offer for FREE! Needing to Improve Your Studying and Learning? † Use this checklist of “Keys to Academic Success in College” to get more organized. † Apply these “Nine Tips for Staying Motivated in College” to overcome your doldrums. † Practice these “Seven Steps to Becoming a Better Note Taker” to engage and learn better. † Fill out and follow the two “Fillable Schedules” titled “Saturday – Friday, 6 a.m. – 1 a.m.” and “Semester Planning” located here. † Attend any department- or ASC-sponsored group helps sessions related to a class. † Apply for an ASC tutor NOW for a class that isn’t going very well. † Set up a one-on-one ASC appointment to learn how to improve specific study strategies. As you know, college semesters fly by. 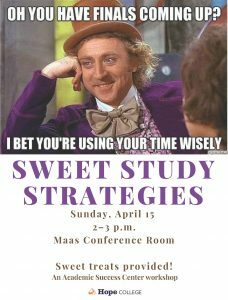 So don’t put off doing the very do-able things available through the Academic Success Center in VanZoeren 261. Here’s our website where you can learn about all the various kinds of help we offer to all students, totally free of charge. Come to a required half hour tutoring information session before you apply. If you attend a session, you can apply on-line, no additional appointment needed! All sessions are held in VanZoeren 240. Posted on January 15, 2018 March 6, 2018 Author Carrie DattelsCategories ASC, TutoringTags Tutoring information sessionLeave a comment on Need a Tutor? All Academic Success Center (ASC) services are free of charge. Thursday, January 11 at 11:00 a.m.
Friday, January 12 at 4:00 p.m.
Monday, January 15 at 4:00 p.m.
Tuesday, January 16 at 11:00 a.m.
Thursday, January 18 at 5:00 p.m.
Friday, January 19 at 3:00 p.m.
Tuesday, January 23 at 11:00 a.m.
Thursday, January 25 at 4:30 p.m.
Tuesday, January 30 at 11:00 a.m.
Thursday, February 2 at 4:30 p.m.
OR, complete an application for tutoring, available on the ASC website or in 261 Van Zoeren, and turn it into the ASC with a printed copy of your schedule. Applications are being accepted starting Wednesday, January 17. If you did not attend an information session, you will need to meet with an ASC intern for your tutor match. You can schedule this follow-up appointment at least two days after you turn in the completed application. Contact and meet with your tutor, decide on a schedule for tutoring, and complete the Tutor/Tutee Agreement form, which you will return to the ASC. Complete a Request for Accommodations form. Meet with staff to discuss your accommodation request. Provide requested documentation that supports your request. Complete an application for academic coaching, available on the ASC website or at the ASC, Van Zoeren 261, and turn it in at the ASC with a printed copy of your schedule. Schedule and attend an appointment with the coordinator for your coaching pair-up. Contact your coach to get started. Call 616-395-7830 or stop in at the ASC, VanZoeren 261, to make an appointment. Meet with staff to discuss your needs. We have a new team member working for Disability Services! Megan Herzog stepped into the recently created position of Services Assistant this past November. The majority of Megan’s work is behind the scenes (Literally. Her work station is around the corner from the front desk of the ASC.) and involves lots and lots of sticky notes. She manages all of our exam accommodations and works closely with student proctors. This means she creates our testing schedules, communicates with professors and students, and organizes other aspects of accommodations. On a big exam day, you will find Megan running back and forth from her desk to the printer as she makes hard copies of tests. You might also bump into her around campus as she delivers completed exams. Megan graduated from Hope College in 2013 and is married to Leo Herzog, the resident Google expert in CIT. She spends most of her free time being as active as possible! Megan enjoys hiking/snowshoeing, ice hockey, and taking her two west highland terriers on walks. If you are ever near the ASC, please stop by and say hi! She would love to meet you. Jeanne Lindell and Carrie Dattels from Disability Services facilitated a discussion on equal access for students with disabilities for faculty and staff. You can read about the information that was discussed at the HHMI Discussion Group blog. Student Success Lunch and Learn 3: Equal Access for Students with Disabilities.